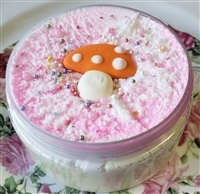 These body scrubs are whipped up into a soft and creamy confection that is the perfect exfoliation treat for your skin. They are packaged in 8oz wide mouth jars. Mounds of sugared frosting, white cake, and a hint of strawberries. 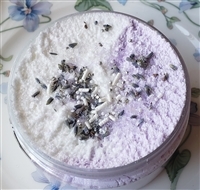 French lavender with vanilla extract and marshmallow fluff. Comes in an 8 oz jar with added shea oil. 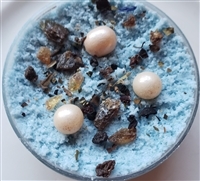 An 8 ounce sugar scrub smelling of blueberry crumble blended with brown sugar and sweet black cardamom tea. Peppermint shavings and black tea are sprinkled with light notes of clove and spearmint. Inspired by Dr. Peppermint by Lush. Comes in an 8 oz jar with added shea oil. "We're all mad here"...Lemon meringue is topped with vanilla and raspberry icing. Comes in an 8 oz jar with added peach kernel oil. Candied mango and tart raspberry blends with sweet furze blossoms. Comes in an 8 oz jar with added coconut oil. Rich and creamy with notes of caramel, custard, cocoa butter, honey, dark chocolate, and sweet cream. Comes in an 8 oz jar with added cocoa butter. An 8 ounce creamy sugar scrub with added aloe butter. 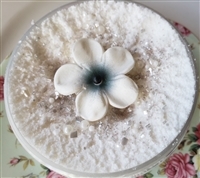 Smells of a strong lavender is blended with vanilla bean custard, with hints of marshmallow and caramel. An 8 ounce creamy sugar scrub with added coconut oil. Smells of creamy almond marzipan is swirled with pomegranate, orange, and spicy notes of cinnamon and cardamom. Topped with a cocoa butter shaped rose. Make no mistake...the Queen of Hearts likes her roses AND her tea red...This scrub is the most amazing scent of Roobios Red Tea. Very comforting and mild, just like the drink. An 8 ounce creamy sugar scrub with added coconut oil. Sweet vanilla cream, sandalwood, and light musk. Comes in an 8 oz jar with added coconut oil.